With care your new marble, granite or engineered stone benchtops will last a lifetime, by following some easy tips and protecting surfaces from heat and spills they will look as good as the day they were installed. Normal cleaning involves only periodic washing with clean, tap water and neutral cleaners. Accent Benchtops recommends soap less cleaners because they minimize sticking and filming. However, mild phosphate-free, biodegradable liquid dish-soaps, soap flake or powders which contain no aromatics are acceptable if able to be thoroughly rinsed - removing all residues. Please refer to your stone brand website for care information . Stone surface should be first wet with clean, mild hot water. Then, using the cleaner solution, wash in small overlapping sweeps, from bottom-up if a vertical surface. Rinse thoroughly with clean tap water to remove all traces of soap or cleaners, change the water in the rinse pail frequently to assist in removing any residues. Dry with soft cloth or cotton-flannel, and allow to thoroughly air-dry. Chamois skin may be used in lieu of a cotton cloth to remove any spots. Spills of any type should be immediately removed and water-rinsed. Coasters should be placed under all glasses, particularly those containing liquors or citrus juices. Place-mats, wooden cutting boards or trivets should be used under heated dishes. Generally, prevention will save a great deal of time spent on cures and remedies, especially since damages to stone, are often irreparable. Polished stone should receive the same care and consideration that is given to a fine wooden finish. We do not recommend placing very hot items (such as saucepans and oven pots) or electric frypans directly on any stone based bench top surface, as this can cause extreme thermal shock. Damage may not be noticed immediately if this is done regularly, however over time hairline cracks may appear reducing the strength of the product. Do not use chemical products for cleaning such as acid like chemicals, on your new bench top as this can cause a build up eventually taking away the high gloss finish that granite & marble achieves. Lighter colored granites will be more prone to staining than darker ones. Wiping spills immediately will help avoid most potential staining. Your bench top is sealed with stain-resistant sealer after installation. Timely re-sealing your granite according to the sealer’s instruction may assist in maintaining lustre and maintain enduring 'new look' of the stone. Products such as coffee, red wine, cooking oils, butter, lemon juice, tomatoes and anything else acidic should be wiped off the bench top as soon as possible. Take care to use the proper cleaning agents; those that are ammonia based can etch the granite and dull its polish. While cutting directly on granite surfaces will not affect the large majority of granite, cutting boards are recommended. Repeated use of a knife in the same place on a granite bench top eventually wears down the polish and will blunt your knives. Be careful of the weak part of the kitchen bench tops, these are normally; for example at the front & back of the sink and cook top. Downward pressure to these area’s can cause cracking or breakage. Although granite is a solid and strong material it will not expand or contract to any measurable degree and therefore should not be subjected to excessive weight, stress or extreme temperatures. This can cause granite to fracture or crack when used as a workbench! Due to its features, Engineered Stone requires very little maintenance to keep the surface looking like new. For everyday routine cleaning we recommend wiping the surface with warm soapy water (a mild detergent) and a damp cloth or alternatively use a quality spray and wipe type cleaner. To remove adhered materials like food gum and nail polish, first scrape away the excess with a sharp blade. If there are any grey metal marks on the surface, a mild detergent will remove it. Household bleach can generally be used as an effective cleaner to remove stubborn marks but care should be taken as some products are considerably stronger than others. Engineered Stone bench top or surface needing a thorough clean? We recommend using cream cleaner, please never use Scratch All-Purpose Scrubber (eg Curly Girl) Alternatively simply using a damp cloth with very mild detergent can produce excellent results. Refer to your stone brand website for more information. Engineered Stone will tolerate brief exposures to moderately hot temperatures, however please avoid prolonged contact with very hot pots, pans, electric frying pans and oven trays directly from the hotplate or out of an oven onto the surface of Engineered stone. We always recommend the use of a hot pad, placemat or trivet to place hot items onto. As with any surface, Engineered Stone can be permanently damaged by exposure to strong chemicals and solvents that undermine its physical properties. So, do not use products that contain trichlorethane or methylene chloride such as paint removers. Avoid any highly aggressive cleaning agents like oven cleaner that have high alkaline/PH levels. Should the surface be accidentally exposed to any of these damaging products, rinse immediately with water to neutralise the effects. The inherent qualities of your solid surface counter tops ensure the ultimate in easy care and renew-ability. Its nonporous, solid composition makes it easy to live and work with for many years. Run cold water when pouring boiling water into sinks. Soapy water or ammonia-based cleaners (most glass cleaners, or general purpose cleaners, will remove most dirt and stains from all types of finishes. Wipe dry with dry cloth to prevent water spots. More difficult stains can be removed using a mild abrasive and sponge. Occasionally clean by filling the sink one-quarter full with a 50/50 water/bleach solution. Let soak for 15 minutes, then wash sides and bottom as solution drains. 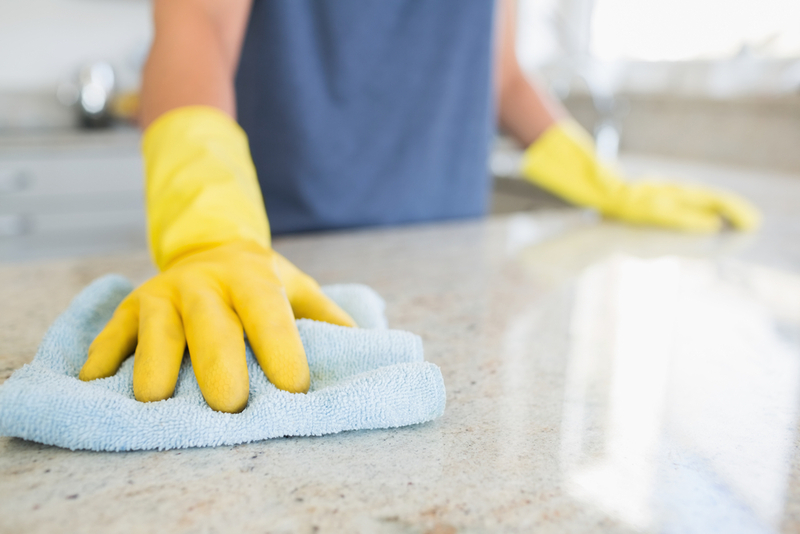 Avoid exposing your solid surface counters to strong chemicals, such as paint removers, oven cleansers, etc. If contact occurs quickly flush the surface with water. Remove nail polish with a non-acetone-based polish remover and flush with water. Do not cut directly on your counter tops. Nicks, scratches and cuts are inevitable with any high-use product, including solid surfacing. But because the material is solid all the way through, it can be renewed to its original appearance. To remove minor scratches, sand in a circular motion, with light pressure, using a 3M gray finishing pad. Apply light water as you sand. Wipe clean. If scratches are deeper and still visible, sand wet in a circular motion using 320-grit Wet and Dry sandpaper, followed by the gray pad. For best results, sand slightly wet, and clean before each step. These products are available at most home centers or hardware stores, and are usually located in the paint department. Keep in mind, the finish on your benchtop was applied by using a 3M Scotch-BriteR pad with an orbital sander. Because of the speed of the sander, hand motion alone may leave a slightly different finish. For best results, work on a wider area and feather in the sanded area or finish the entire surface with the Scotch BriteR pad. Nicks. Stains. Cuts. Scratches. While these can permanently mar most other surfaces, they won’t compromise the appearance of your solid surface counters. That is because they can be restored to their original state. If damage does occur, solid surfacing can be repaired on site, saving both downtime and aggravation. Periodically, you may wish to have your solid surface tops refurbished professionally. Our customer service department can assist in arranging this service. Thank you. We know you will enjoy your new solid surface benchtops for many years to come! General Cleaning Using a mild household spray wipe down the bench top with a soft cloth. Dry using a soft cloth so as not to leave any cleaning solutions on the surface. You may also use Methylated Spirit on a soft cloth, using a circular cleaning motion. Thoroughly clean over the wider area with water and detergent on a damp cloth afterwards to remove any residual Methylated Spirit. Avoid placing hot pans, pots or similar hot objects directly on the surface of the product. Avoid placing heavy objects on the product; apply substantial pointed weight to the product including standing, sitting or lying or; apply excessive impact to or mishandle the product, including scraping objects along, throwing objects against or dropping objects on the product’s surface. You also can visit our blog for more important information and tips. You can leave your comments and suggestion or any other idea you want to share . for regular blog update please subscribe us.